Usually my family decorates for Christmas on Thanksgiving day before the big meal. By “family” I really mean I singularly decorate for Christmas, barking orders at my family to fetch boxes of ornaments and such from the attic and hang up the lights as soon as possible. By “usually” I mean every day up to this year, where my brother proclaimed he would prefer we hold off Christmas decorating until after his birthday. His birthday is December 1st, and while I kind of understand his annoyance with sharing his single day of birth with snowflakes, snowmen and jolly Santa decorations, I’m kinda sorta itching to do something. Can’t I like, hang a snowflake somewhere? Please? Doing the house up xmas-style has to be my favorite decorating of all time. We have lame Halloween decorations, mostly consisting of our stuffed dummy named Otis whom we hang from a tree outside to scare kiddies with, as well as a Dollar-store investment of a strobe light and maybe a broken light-up pumpkin. Ain’t no spooky spectacular here. Christmas decorating is quite glorious. Ornaments glistening on the pre-lit tree (we buy fake, sue us); festive candles making our house smell like a giant freakin’ candy cane; and obviously, the lights on the outside of our house. Now, before I proceed with a huge Hayley tirade, please know I’ve thought this out completely and in my mind, I make total sense and everyone agrees with me and no one–I mean NO ONE–questions of judgment. Because I’m right. Always. The end. I have some Christmas light pet peeves. 1. Blinking lights on timers. One of the biggest of them all has to be timed blinking lights. You know, when you’re looking at a house and half the lights are lit up and you think, “those people are obviously way to lazy to fix that huge long strand of broken lights, those cheap–oh wait, they came on. And now the previously lit up part is dark. This is tacky. Let’s judge those people for their bad taste in timing lights forever until the zombie apocalypse.” Fix your lights and stop their blinking because crazy OCD people like me judge you. 2. Lights that aren’t properly measured out/even. Second runner up is a person’s inability to measure their strand of lights to the trim on their house properly. Some houses will be so gorg, but when I spot that random strand of lights abruptly end in the middle of the garage door’s trim, I’m like … wtf. Meanwhile, the other end of the house has an extra long trail along the side of the house’s trim, which makes no sense. It should be even. Everything should be balanced. There shall be NO UNEVEN LIGHTS ON TRIM. It makes me batty, people. 3. Colorblocking is OK for clothes, tacky for homes. Word. Don’t have half a strand of colored icicle lights, only to have regular gold ones right next to it. Looks dumb, yo. 1. Blinking lights =bad. Twinkling lights=okay. If your lights clearly twinkle, and aren’t abruptly turning dark and relighting over and over, it looks pretty. Everyone loves twinkling things. 2. Going all crazy for Christmas. If you clearly spend hours or days making your house into an electrical hazard, I like you–lots. You’re what makes me excited to go looking at lights, but pity you for your PG&E bill. And you obvs should teach a class on proper Christmas light decorating etiquette. 3. Color-changing lights are neat. Color-blocking is a no-no, but if your lights gradually change into different fun colors, it looks cool. I know what’s best–trust me. I’ll just need to make sure my brother and dad know all the rules of the game before they hang up our lights on December 2… because I will not live in a house with unsuitable light conditions. It can’t happen. It won’t. Perhaps I’ll bribe them with peppermint bark fudge. Usually food works as an excellent bribery tool in this household. We’re all food-motivated, just so you know. Bake me a cheesecake or cook me dinner and I’m yours, no contest. Unless it’s pork chops, in which case I will probably cry and pout. I hate pork chops, but that’s a different story. 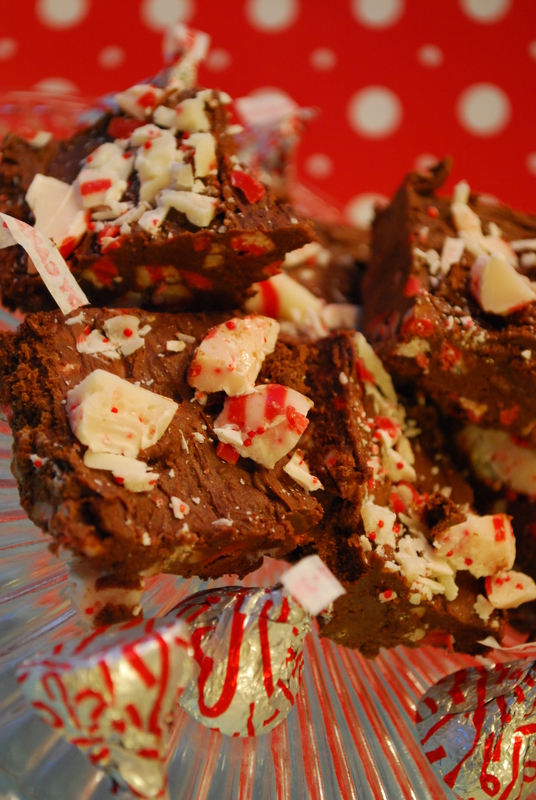 Wanna make yourself some peppermint bark fudge? Of course you do, completely-sane-and-suitable-Christmas-light-hanger-person. Peppermint Bark Fudge *inspiration for recipe came from Shelly’s 3-ingredient fudge from Cookies and Cups. 1. Lightly grease an 8×8 inch baking pan. Set aside. 2. Melt chocolate chips in the microwave according to package directions until smooth and melted, careful not to burn! You can also use a double boiler method if preferred. 3. Once chips are melted, stir in the chocolate frosting and the teaspoon of peppermint extract until blended. Mixture will be very thick. Pour in one cup of the Andes peppermint baking chips, and stir to combine. 4. Spread mixture into your prepared pan. I lightly sprayed my rubber spatula with cooking spray to help press the fudge into the pan in a smooth, even layer. 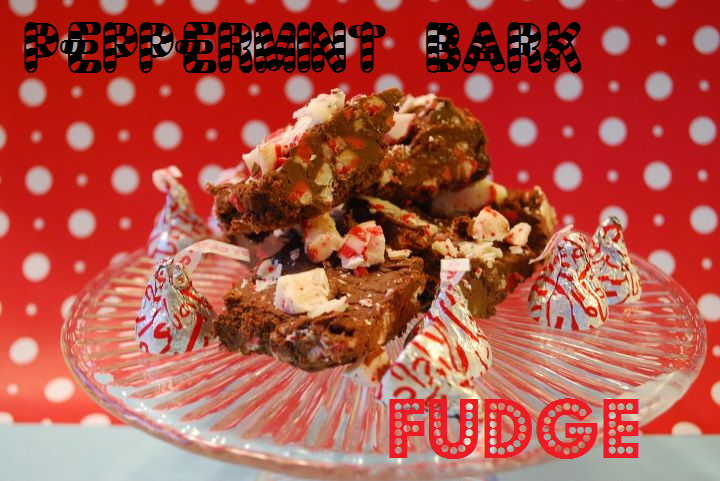 Sprinkle top of the fudge with the chopped candy cane kisses or another cup of crushed candy canes or the Andes chips. Gently press into the fudge with clean hands. 5. Allow your fudge to set, about 30 mins-1 hr, and then use a damp knife to cut into squares. Store airtight in fridge. Wrap these cuties up for a super-easy treat to give to coworkers, neighbors, your kid’s teacher, or friends. So easy, and only like, 4 ingredients. Can’t beat that! Stay tuned for more amazing Christmas recipes–I can’t wait! And be safe hanging up those lights! Awesome adaptation! I bet this is fantastic…and to be perfectly honest I wanted to make this exact same thing with white chocolate but sidetracked with the peanut butter ritz! So glad it came out ok! Hey Shelly– thanks a bunch for the initial idea! Now I’m being honest when I say I love fudge but I really get intimidated by making it the “hard” way (read: the way that requires lots of steps and what seems like a degree in chemistry or something). So this shortcut was awesome and I loved the endless variations. Yours still sounds amazing–may make that for my last days of classes! Thanks again for a wonderful idea and your support; it means so much! xo. Oh man, did you really just have to make me drool at that delish looking fudge? you’ve made me so sad that we can’t get candy cane kisses here in England! I even emailed all the American shops that sell U.S candy over here and they can’t get any either!! Glad I came across your blog though, everything you bake looks very yummy! Hi there! I had no idea the kisses weren’t widely available; a shame England doesn’t sell ’em but you can surely (and easily) substitute them with crushed candy canes OR chopped Andes peppermint crunch candies (the chocolate and mint candies). Thanks for visiting; glad to have you!-and if you make this, let me know how you liked it! xo.